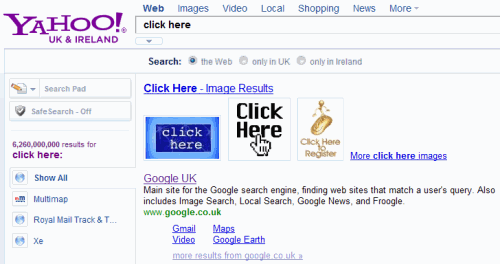 Who Ranks #1 for the Search Term “Click Here”? Anyone involved in search engine optimisation knows the value of anchor text links – be they external or internal. However, convincing an audience who are less experienced at SEO or SEO copywriting is another matter. Whenever we run an SEO course, we ask attendees “who ranks #1 for the search term click here“? They initially look somewhat bewildered at such an odd question, but the answer quickly highlights the value search engines attribute to the anchor text of a link – especially an external link. Ok let’s look at the current set of results. On Google, Adobe ranks #1 for click here. Note that the URL refers to the Adobe Reader. On Bing, clickhere.com ranks #1 followed by Adobe in position 2. Again the Adobe Reader URL is the landing page. On Yahoo, interestingly, Google currently ranks #1. Seeing the Adobe Reader URL rank prominently in both Google and Bing SERPS, it very quickly dawns on the group why Adobe should rank so well for an innocuous search term such as click here; the large number of backlinks containing the anchor text click here being the answer. In fact according to SEOmoz’s Open Site Explorer, the URL ﻿http://get.adobe.com/reader/ has 104,119 linking root domains and 1,722,798 links in total. In terms of anchor text, Open Site Explorer reports that the URL ﻿http://get.adobe.com/reader/ has 5,894 linking root domains and 35,710 links containing click here as the anchor text (row 5). So there we have it. Not a huge revelation to experienced SEO’ers but possibly more eye opening to editors or copywriters who may not appreciate the value of anchor text.